If you’re a keen fisherman, there are many reasons you should consider buying a boat. Even a modest fishing boat lets you get out to fish waters you can’t reach in any other way. Your first fishing boat doesn’t have to be expensive. You can be out on the water fishing in a brand new aluminum boat for as little as $2,000. 1. How Will You Use Your Boat? If you’re investing in a boat, think of making the most of it by using it for family days, leisure trips and more. Alternatively, it may be exclusively for fishing. Will you be going out alone or with companions? All these things will decide what size and type of boat you choose. 2. River, Lake, or Ocean? 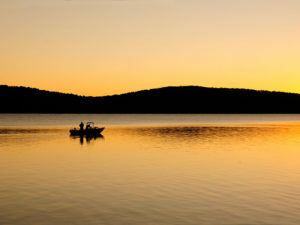 Different waters make different demands on both the fisherman and his boat. There are boats designed for rivers, others for the lakes, or for coastal waters. The boat you buy will depend on where you intend to use it. 3. How Much can You Afford? It’s not just the expense of purchasing the boat you need to consider. You should factor in maintenance and repairs, dry storage, slip fees, and transport. If you’re new to fishing from a boat, do a short course to make sure you are safe. All of that can add to the cost. 4. Do You Need Training? Before you go out and buy a fishing boat, remember there’s more to boating than pushing off and riding the waves. If you’ve never been out on the water before you’d do well to take a training course with your local club. Not only will you have a certificate at the end of the course, but your confidence will have grown, you’ll be safer on the water, and you’ll have made new friends as passionate about fishing as you are. 5. Who Will Maintain Your Boat? Horror stories of maintaining a boat got you worried? Maintenance on aluminum boats is easy and many people actually enjoy looking after their boat as much as they do going out on the water. If this is keeping you back from making memories that’ll last forever, try starting out with a smaller boat with an easily maintained outboard motor such as our “Open Boat” range. Not sure what boat is right for you? Consider using our “match me to a boat” tool to find out what boat fits all of the above criteria just for you! There are boats to suit all budgets. Looking for a second hand boat? You can get a boat from your local club or boatyard where advertisements are often posted on a board, you can also search our used boats section as we often have “previously loved” boats for sale. You can search online for new or used fishing boats or look through the classified ads in the local paper, just be sure to include: “aluminum boats” and “silver streak” in your search. Every keen fisherman should try fishing from a boat. Whether taking to the river, the lakes or the ocean, it’s a great way to expand your hobby. You can use these four questions to make sure you get the best boat for your needs.